The Horie Orgel Museum, (MAMI) is using all content on this website for educational purposes only and to further advance the understanding of automated musical instruments in general, and of the collection of automated musical instruments owned by MAMI specifically. Furthermore, all material on this website is used without any commercial intent. If you are a copyright holder of material shown on this website and you have any valid objection to the its use, please be so kind to contact us. In the development of this website we consulted various sources. Extensive research was done to make our reference/source list is as complete as possible. However, we cannot guarantee the completeness of this list. If you have any additional information for us in order to resolve any unintended omission, we would very much like to be informed. – Manufacturer: Genève. Le Théâtre Abstract/medium: 1 print : color photochrom ; sheet 17 x 23 cm. 1890. Library of Congress Catalog: https://lccn.loc.gov/2017660912. 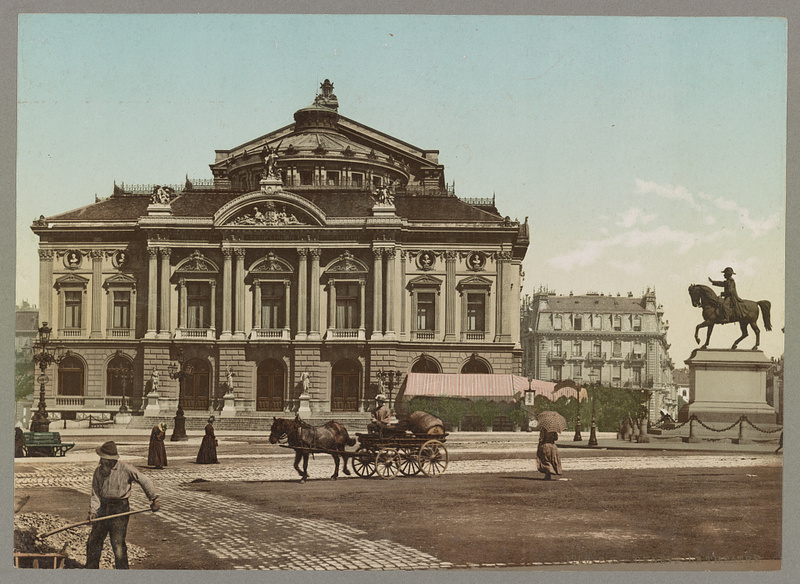 – Manufacturer 1: Boulevard de la Madeleine with the Church de la Madeleine on the left, Paris. Original image: Photochrom print (color photo lithograph) Reproduction number: LC-DIG-ppmsc-05201 from Library of Congress, Prints and Photographs Division, Photochrom Prints Collection. Reproduction by Photoglob AG, Zürich, Switzerland or Detroit Publishing Company, Detroit, Michigan. Author unknown. – Manufacturer 2: Scanned image of a print made by Theodore Lane (1800 - 1828) and published in 1826 by Charles Smith (1800 - 1852). The print depicts the Automaton Exhibition at Gothic Hall in Haymarket section of London. The scan of recto type was presumably done by The Trustees of the British Museum on an unknown date. Author: Theodore Lane (1800 - 1828). – Manufacture 1: The interior of the Bon Marché department store (1875). Albert Chevojon (1865-1925), photo vers 1900, domaine Public - Intérieur du Bon Marché, Archives Moisant-SaveyI. Grand escalier et serrurerie Moisant, Laurent, Savey. – Manufacturer 1: Notenzeichner für Pianola-Rollen 1911 im Londoner Werk der Aeolian Company. – Manufacturer 2:	Aeolian Factory at Hayes, Middlesex, England c1920. – Technique 1: "Grainger (Percy) editing duo-art pianola music rolls, no. 1, 2. ": this is registered as part of a collection of 33 photographs under J 215266–215298. The Library of Congress has 18 of these photographs in this set. – Logo The Aeolian Company: Ad for The Aeolian Company from The New York Times dated October 26, 1908. – Manufacturer 2: Hupfeld Fabrik, 1911. Altes Firmenprospekt aus eigenem Besitz. Author KarlKunde. – Edison and phonograph: Thomas Edison and his early phonograph. Cropped from Library of Congress copy. Brady-Handy Photograph Collection. – Paul Uestel. Le phonographe Edison, à la section des États-Unis. 1889. Located at Brown University Library. Huard, Charles-Lucien..
Livre d'or de l'Exposition, Tome 1. Paris: L. Boulanger, 1889. – Manufacturer 1: Photograph, Gramophone Assembling Room, Berliner Gramophone Co., Montreal, QC, 1910. – Manufacturer 2: Emile Berliner, with the model of the first phonograph machine which he invented. Between 1910 and 1929. National Photo Company Collection (Library of Congress). – Technique 1: His Master's Voice. Victor Talking Machine Company. https://commons.wikimedia.org/wiki/File:His_Master%27s_Voice.jpg – Technique 2: Enrico Caruso with a "Victrola" brand phonograph. Glass negative. No date recorded on caption card. c. 1910s. This image is available from the United States Library of Congress's Prints and Photographs division under the digital ID ggbain.29837. Unknown photographer; Bain News Service, publisher. Restored by Michel Vuijlsteke. – On the company: Gelatt, Roland, The Fabulous Phonograph: 1877—1977, MacMillan, New York, 1954 and "RCA Nipper Window on Display at Rutgers". Historiccamdencounty.com. Retrieved 10 January 2018 and Barnum, Fred, "&apos;His Master&apos;s Voice&apos; In America", General Electric Co, 1991. – Manufacturer: Chickering pianos, no.334 Washington St., 1838-1852. 1823-1903. Boston: Chickering & Sons, 1904. Artist unknown. – Gelatt, Roland, The Fabulous Phonograph: 1877—1977, MacMillan, New York, 1954 and "RCA Nipper Window on Display at Rutgers". Historiccamdencounty.com. Retrieved 10 January 2018 and Barnum, Fred, "'His Master's Voice' In America", General Electric Co, 1991.